This is my power supply. A good power supply is essential for any good SDIY project. 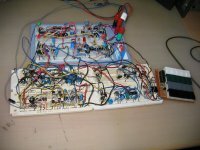 The internals of this supply is a linear PowerOne dual 12V/-12V (and 5V) supply that can deliver up to 1.7 Ampere. 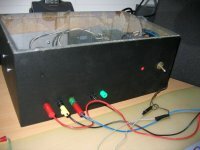 I built this supply into an old speaker box. 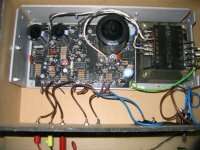 At the right of the left picture you can still see a fragment of the original speaker which I'm actually still using for producing the synth sounds. 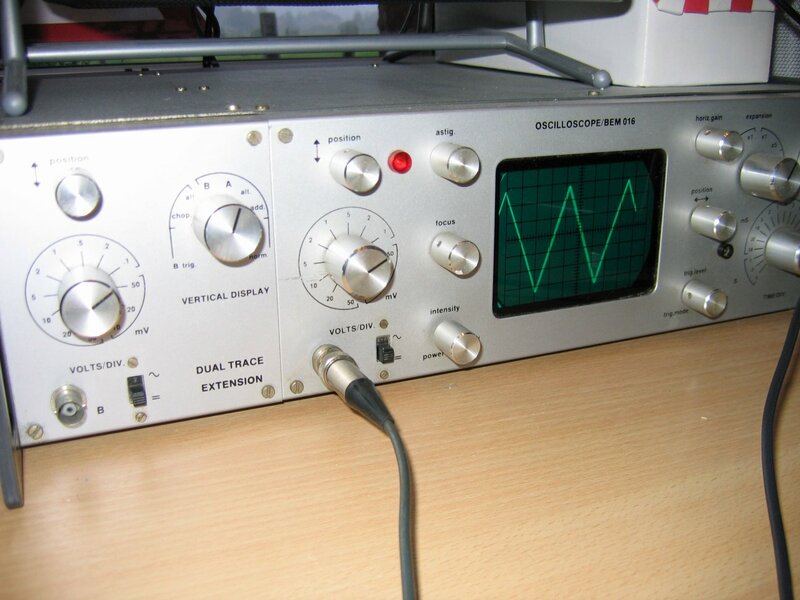 This is a 25 years old oscilloscope. It still works sufficiently for my purposes. On the photo it is showing the triangle wave generated by one of the VCO's. Here is a global overview of all circuits I have build so far. Below you can see a few closer shots with some explanation. 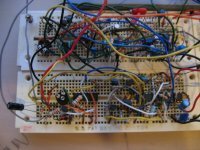 On the upper part of this breadboard you can see (from left to right): a modified psycho LFO (Ken Stone's CGS03) and half of the utility LFO (Ken Stone's CGS58). 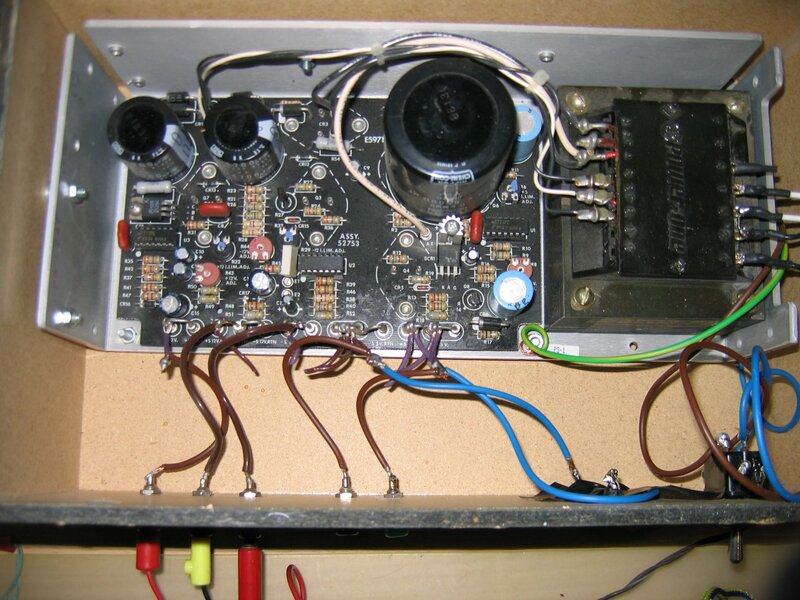 On the lower part you can see (at the left) a simple VCA (VCA2 from Synthesizer DIY pages) and a DC mixer ( Ken Stone's CGS04). In the middle you can see half of a Drum Simulator (Ken Stone's CGS18) and on the right you can see a simple LFO that I made myself. 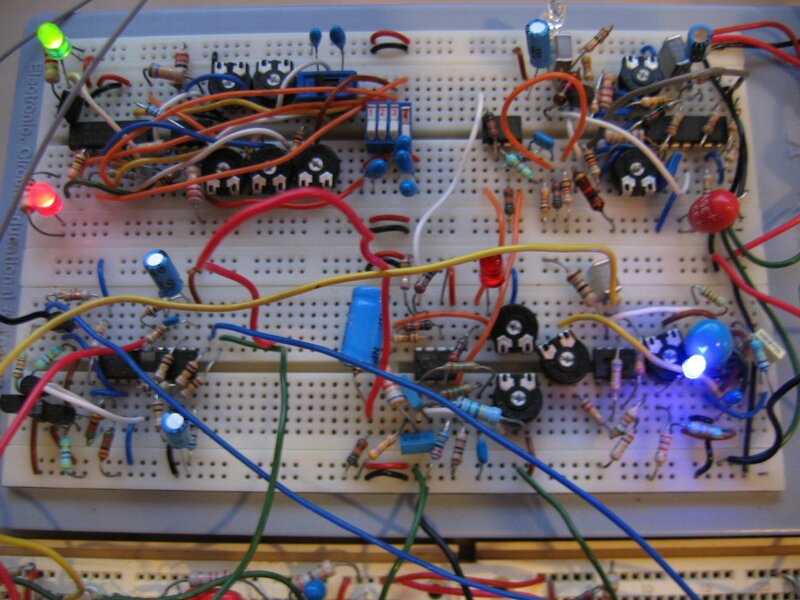 The upper breadboard is the Synthacon VCF ( Ken Stone's CGS35) and again another copy of the VCA (see above picture). Note that the VCA and VCF share the same TL072 here and that's probably not a good idea for noise reasons. 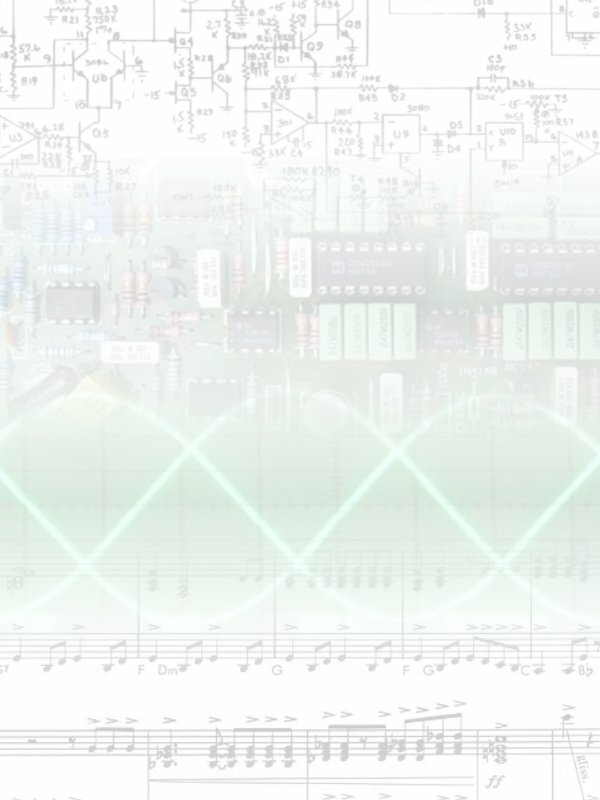 On the lower breadboard (on the right) you can see the triangle core of a Buchla VCO (Bergfotron site) and on the left you can see the simple wave folder (Ken Stone's CGS52). 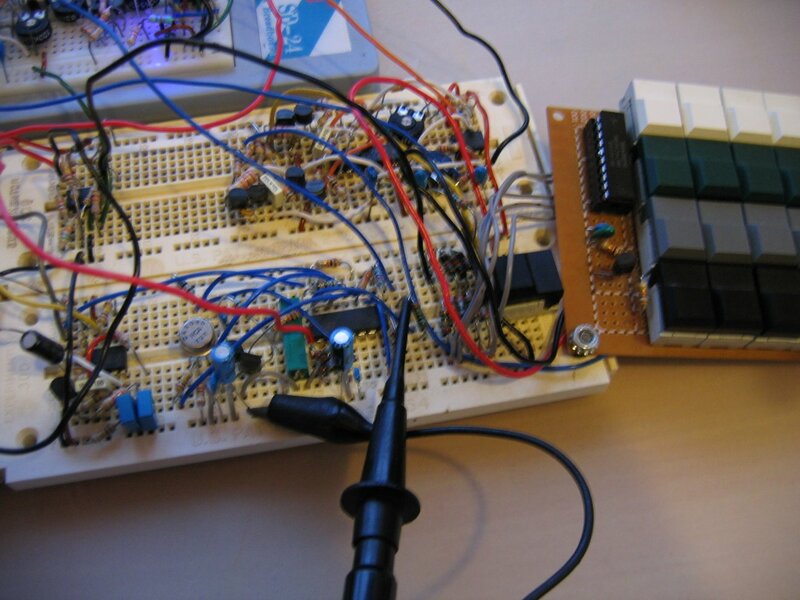 On the upper breadboard (on the left) you can see part of the mini keyboard (Ken Stone's CGS10). The rest of this keyboard you can see on the separate module on the right (my very first hand-soldered circuit!). 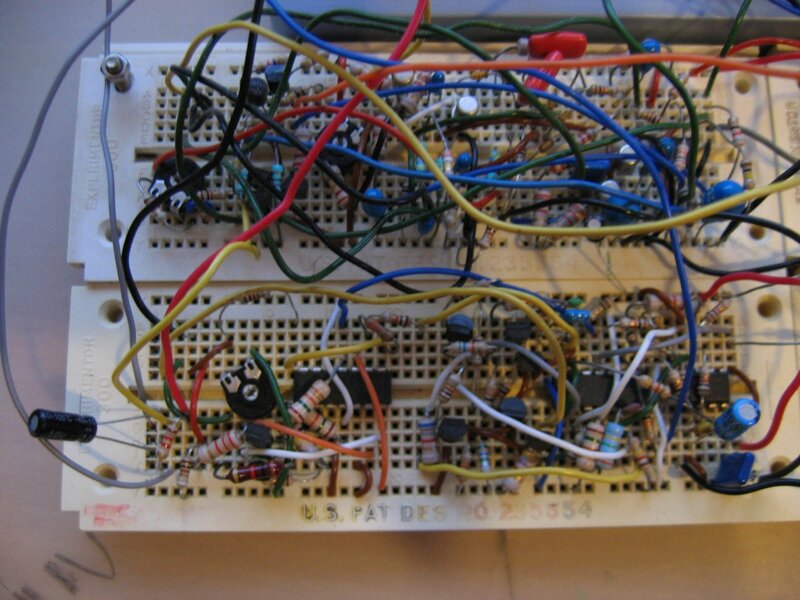 On the upper/right you can see a dual ADSR (of which the DS pots are hardcoded due to lack of space) from Synthesizer DIY pages. 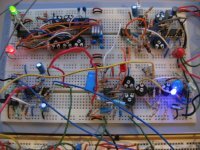 The circuit on that page is a single ADSR but I doubled it using a 556 (intead of a 555) and the two opamps of a TL072. 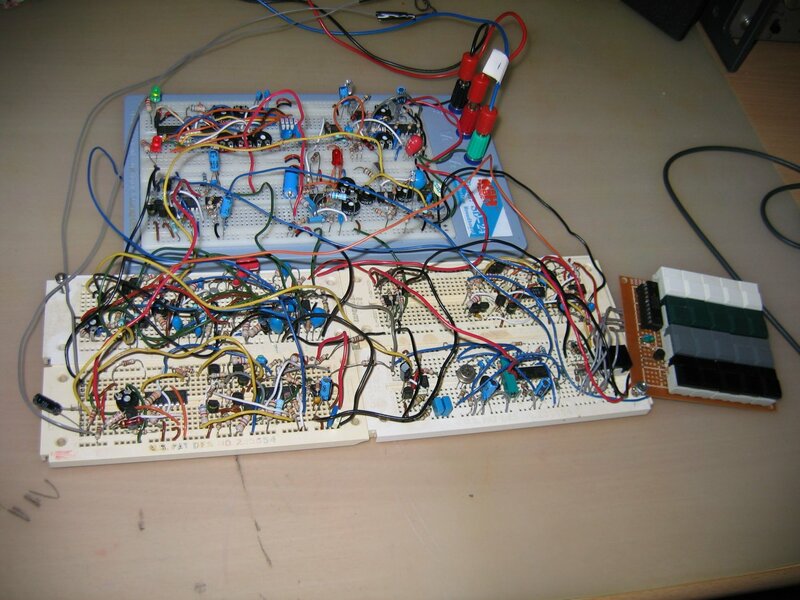 On the bottom/left breadboard there is a simple noise generator (also from Synthesizer DIY pages). 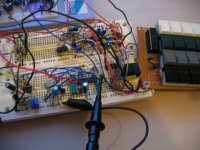 Then a simple VCO from Keith's Synth Stuff and on the right another part of the mini/keyboard and a simple button to trigger the noise ADSR.